Jacob Dalton Stanley graduated in December from Crown Point High School. He completed Marine boot camp on Friday, and flew home to attend his senior class’ graduation ceremony. During practice, Principal Chip Pettit reportedly told Stanley that he was not allowed to wear his uniform at the weekend graduation. Stanley decided to wear his dress blues anyway. The Marines do not have a policy on dress for high school graduations, leaving the decision up to the individual school districts. It’s not just Marine uniforms that are causing controversy throughout the country. 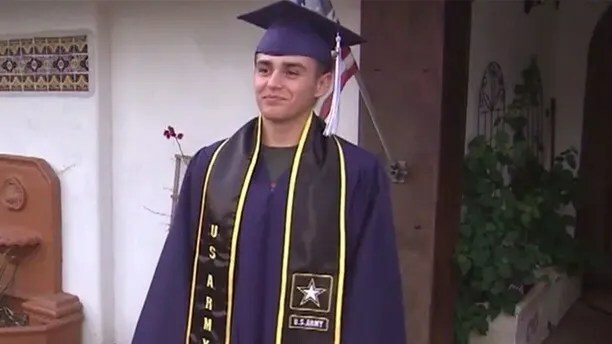 In Kokomo, Ind., and Redlands, Calif., high school graduates enlisting in the U.S. Army were not allowed to wear their Army stoles over their robes at graduation. Joe Velazquez, Elias’ father, shared his feelings toward the school’s policy against any sort of adornments on graduation day. “It’s kinda defeating the purpose of achieving that greatness. We push our kids to strive and try to be better and do the best they can and then we tell them at their grad ceremony we need you to all be the same because we don’t want to hurt anyone else’s feelings,” said he senior Velazquez. Read more from the Times of Northwest Indiana.